PYONGYANG, North Korea -- South Korean President Moon Jae-in arrived in North Korea on Tuesday and began his third and possibly most challenging summit yet with leader Kim Jong Un. 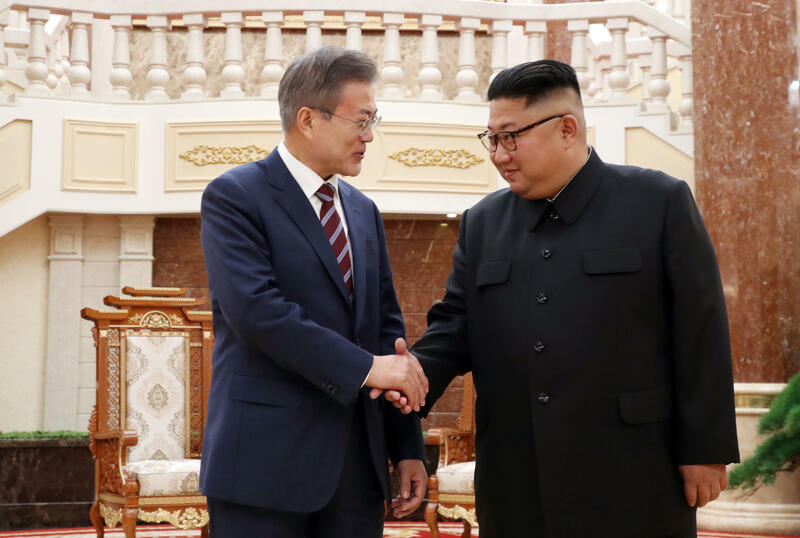 Moon had hoped to break an impasse in talks with the United States over the North's denuclearization and breathe energy into his own efforts to expand and improve relations between the Koreas. After the two hours of closed-door talks, it wasn't clear how much he had managed to accomplish, but the atmosphere between the two leaders appeared warm. Kim gave the South Korean president an exceedingly warm welcome, meeting him and his wife at Pyongyang's airport - itself a very unusual gesture -- then riding into town with Moon in an open limousine through streets lined with crowds of North Koreans who cheered and waved the flag of their country and a blue-and-white flag that symbolizes Korean unity. The made-for-television welcome is par for the course for Moon's summits with Kim. They had already met twice this year at the border village of Panmunjom, but Moon's visit was the first by a South Korean leader to the North Korean capital in 11 years. Moon's summit with Kim was held on Tuesday at a ruling Workers' Party building in Pyongyang. Two top officials each from North and South Korea also attended the summit meeting along with their leaders. "It's not too much to say that it's Moon's efforts that arranged a historic North Korea-U.S. summit. Because of that, the regional political situation has been stabilized and more progress on North Korea-U.S. ties is expected," Kim said, according to South Korean media pool reports and Moon's office. Moon responded by expressing his own thanks to Kim for making a "bold decision" in a New Year's speech to open a new era of detente and send a delegation to the South Korean Winter Olympics in February. The results of the talks weren't immediately available. Seoul officials earlier said they would focus on how to achieve denuclearization of the Korean Peninsula, decrease military tensions along their border and improve overall ties. The North's media said the talks would reaffirm their commitment to Korean peace, unity and prosperity. During a conversation at the Paekhwawon guest house where Moon was to stay, Kim said North Koreans hope diplomacy will yield positive results. "I think it was our people's wish that we come up with good results as fast as we can," Kim said, according to the media pool reports. Moon and Kim were expected to meet again on Wednesday. The summit came a day after U.S. U.N. Ambassador Nikki Haley called out Russia and China for consistently skirting U.N. sanctions against North Korea, during an urgent Security Council meeting called by the U.S. The sanctions are aimed at pressuring the regime to abandon its nuclear and missile programs. Moon is under intense pressure from Washington to advance the denuclearization process. Before his departure he said he intended to push for "irreversible, permanent peace" and for better dialogue between Pyongyang and Washington. But his chief of staff tried to lower expectations of major progress on the future of Kim's nuclear arsenal. Traveling with Moon are business tycoons including Samsung scion Lee Jae-yong, underscoring Moon's hopes to expand cross-border business projects. Currently, all major joint projects between the Koreas are stalled because of U.S.-led sanctions. Moon was expected to have talks with Kim on Tuesday and Wednesday, according to Moon's chief of staff. Moon and Kim were also expected to jointly announce the results of their talks on Wednesday if things go smoothly. Moon is to return to Seoul on Thursday. Moon and his wife, Kim Jung-sook, were greeted by Kim and his wife, Ri Sol Ju. The North Korean leader then led his guests to meet some of his senior officials, and they exchanged mutual greetings with Moon's delegation. Thousands of North Koreans cheered and waved flower bouquets and national and unification flags. North Korean soldiers and naval troops quick-marched into position to welcome Moon, and the two leaders inspected the honor guard, according to South Korean media pool footage from the site. A signboard said, "We ardently welcome President Moon Jae-in." As Moon arrived, the North's main newspaper said the United States was responsible for the lack of progress in denuclearization talks. "The U.S. is totally to blame for the deadlocked DPRK-U.S. negotiations," the Rodong Sinmun said in an editorial. It said Washington is "stubbornly insisting" the North dismantle its nuclear weapons first, an approach "which was rejected in the past DPRK-U.S. dialogues," while failing to show its will for confidence-building "including the declaration of the end of war which it had already pledged." Kim is seemingly riding a wave of success. The North just completed an elaborate celebration replete with a military parade and huge rallies across the country to mark North Korea's 70th anniversary. China, signaling its support for Kim's recent diplomatic moves, sent its third-highest party official to those festivities. That's important because China is the North's biggest economic partner and is an important political counterbalance to the United States. North Korea maintains that it has developed its nuclear weapons to the point that it can now defend itself against a potential U.S. attack, and can now shift its focus to economic development and improved ties with the South. While signaling his willingness to talk with Washington, Kim's strategy has been to try to elbow the U.S. away from Seoul so that the two Koreas can take the lead in deciding how to bring peace and stability to their peninsula. North Korea has taken some steps, like dismantling its nuclear and rocket-engine testing sites, but U.S. officials have said it must take more serious disarmament steps before receiving outside concessions. Mr. Trump has indicated he may be open to holding another summit to resuscitate the talks, however. To keep expectations from getting too high, Moon's chief of staff, Im Jong-seok, said it's "difficult to have any optimistic outlook" for progress on denuclearization during the summit. But he said he still expects the summit to produce meaningful agreements that "fundamentally remove the danger of armed clashes and ease fears of war" between the two Koreas. South Korea last week opened a liaison office in the North's city of Kaesong, near the Demilitarized Zone. Another possible area of progress could be on a formal agreement ending the Korean War, which was halted in 1953 by what was intended to be a temporary armistice. Military officials have discussed possibly disarming a jointly controlled area at the Koreas' shared border village, removing front-line guard posts and halting hostile acts along their sea boundary. Moon is the third South Korean leader to visit North Korea's capital for summits. Kim Dae-jung and Roh Moo-hyun went to Pyongyang in 2000 and 2007 respectively to meet Kim's father, Kim Jong Il. Those trips produced a slew of inter-Korean rapprochement projects, which were suspended after conservatives took power in Seoul.